The Northeast Florida Builders Association announced the winners of its 2018 Parade of Homes and Generation Homes was recognized by parade goers and industry professionals as one of the First Coast’s premiere custom home builders for craftsmanship, design, and attention to detail. The spectacular Sea Shell model home at 62 Oceanview Dr. in Sea View took top honors. The Sea Shell is a two story cottage and is located just a few minutes walk to the beach. The home home is a four bedroom two bath home with a powder bath on the main level. The master bedroom is located on the first floor with a spa like master bath. The staircase has stained wood treads and unique horizontal hand railing leading to the second floor. 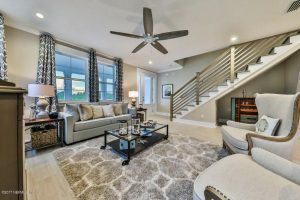 Parade of Homes 2018 ran from April 14th through the 29th. This year’s competition featured 91 homes across 65 neighborhoods with an assortment of home styles and prices from the low $300’s to $1 million plus. The event was open to the general public who were able to tour the designer-decorated homes and vote through the Parade of Homes mobile app. According to NEFBA, there were over 850 app downloads. Generation Homes builds custom homes in Sea View and premier communities along the First Coast from South Ponte Vedra Beach to Hammock Beach, including Vilano Beach, Davis Shores, Pelican Reef, Anastasia Dunes, Magnolia Dunes, Marsh Creek, Sea Colony, Sea Grove, and Whispering Oaks and the Hammock on coastal private lots. To learn more, contact Generation Homes (904) 955-4769.